When Mallory discovers that her boyfriend has been cheating on her with a girl he met through an online game she vows to ditch both him and the internet. The next day while sorting through some of her grandmother's old boxes Mallory stumbles across a list written when her grandmother was 16. Mallory decides that things were much easier for teenagers at that time and to get over Jeremy she must fully commit to going vintage while completing her grandmothers list. Following the list has some surprising results when family secrets are revealed and family bonds are tested. I really enjoyed some elements of this book. Mallory is an obsessive list maker just like her grandmother and each chapter starts with a different list. 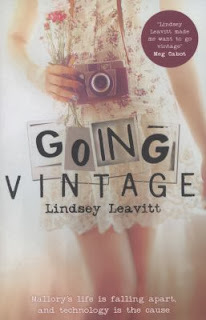 Mallory's heart is broken and she has a lot of difficult things happening in her life but she works through them with her quirky sense of humour that makes 'Going Vintage' very fun to read. If you find Meg Cabot funny then Mallory is the girl for you. The way that Lindsey Leavitt writes about the fallout of the breakup exploding on Friendspace and Mallory's feeling of isolation when she gives up her phone and social media seem very true to life although I was a bit disappointed with the way Mallory deals with the online bullying she gets. The rumour mill runs wild at school and on Friendspace but Mallory seems not the slightest bit upset about it. She's smart in not feeding the trolls but she doesn't seem to be bothered by it at all. I feel that in reality she would still feel at least a little bit hurt by what people were saying. Of course, Going Vintage wouldn't be complete without some flirtation and romance especially when "find a steady" needs to be ticked of Grandma's list. You get to watch the relationship between Mallory and her love interest change and grow throughout the book which is completely different to the insta-love that happens too often in other books. They have their setbacks and their issues that make the friendship and romance much more believable. "Going Vintage" isn't an "omg this will change your life!!!" book but it's a great story. It's funny and realistic and would be the perfect summer read.